Through active participation in the Divine Liturgy on Sundays and holidays, the Altar Boy program instructs boys on the meaning of the Divine Liturgy, other services, and the fundamental sacraments of the church. The role of the Altar Boy remains a genuine and vital one in the Eucharistic Assembly of the Faithful, as well as in the other services. He stands ready to serve God in this capacity. It is a stewardship of young men; a service that they offer to God as their regular Sunday offering of talent and ability. 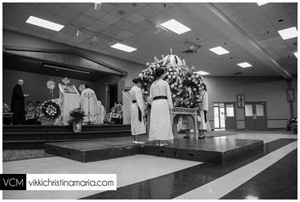 All the actions, all of the movements of the Altar Boy serve to uplift the congregation in their time of worship. The way he performs these actions, and the actions themselves, brings the people in the congregation to a greater understanding of the Divine Liturgy. This is true of the other divine services as well; to bring the people to a greater love for God, a closeness to God, and serenity of the soul. 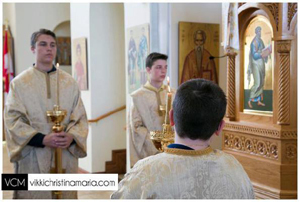 The Altar Boy has a place of honor in the Divine Liturgy because it is he who assists the Priest in so many ways. His behavior and performance can be a sign of his faith, his love, and his prayer life for God and for God’s people. The Altar Boy is in a holy place, the Altar, where all the Divine Services are celebrated. It is the place where we are near God at all times. It is equivalent to the place that Moses went to; on the mountain facing the burning bush. God spoke to him there and said: The place where you are standing is a holy place. Remove your shoes and be attentive. The same may be said about the Altar. It is a holy place, and dignity and respect must be ever present in all we say and all we do as Servers of the Lord. To inquire about the Altar Boy program or to register a child for the Altar Boy program, please contact Father via the Church office at (519) 438-7951. In the Gospels, especially the synoptics, women play a central role as eyewitness at Jesus’ death, entombment, and in the discovery of the empty tomb. Among the named women (and some are left anonymous), Mary Magdalene is present in all four Gospel accounts, and Mary the mother of James is present in all three synoptics; however, variations exist in the lists of each Gospel concerning the women present at the death, entombment, and discovery. For example, Mark names three women at the cross and the same three who go to the tomb, but only two are observed to be witnesses at the burial. It is tradition in the Orthodox Church for girls to volunteer during Holy Week to serve as myrrhbearers during Holy Week especially on Holy Friday and Holy Saturday. They wear pure white robes. Their role in the church today is to remind us of their unique role in the ministry of our Lord and Saviour as is mentioned in the synoptic gospels of Matthew, Mark and Luke. They are the eyewitness who went to the tomb early Saturday morning and beheld first hand the Resurrection of our Lord and were charged by the angel to go and tell the disciples. This role in the liturgical life of Orthodox Church is visible only during Holy Week. Young girls ages 9 and up that are interested in serving as Myrrhbearers are encouraged to contact Father via the Church office at (519) 438-7951.